Y’all know how much I love farmhouse style. Well, when my son Frederick recently left for college it gave me the opportunity to turn his lackluster bedroom into a quaint farmhouse bedroom. When he left the first thing that happened was my boys switched rooms. My younger son Julian got “the big room” as promised. He had been patiently waiting for 4 years, watching first his sister Bianca enjoy the room and then his older brother. So this room switch started my rethinking both rooms. 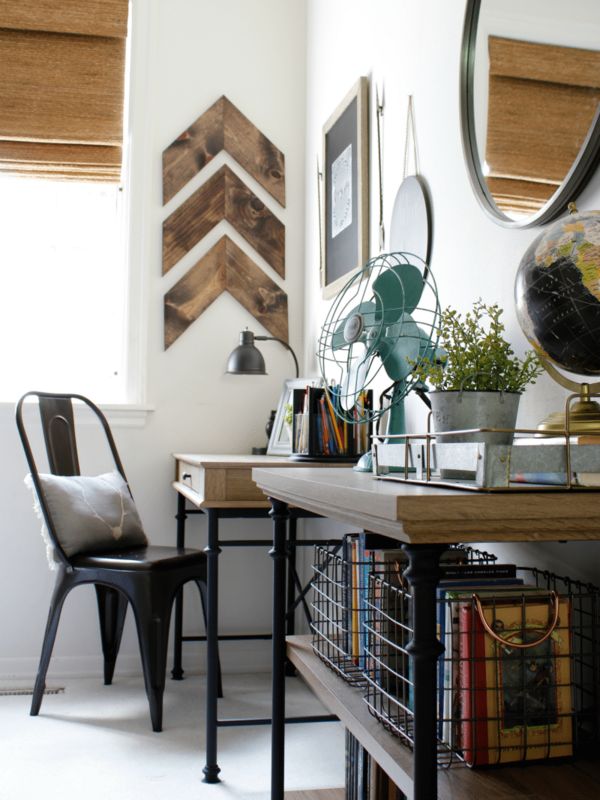 I’ve already revealed the updates to Julian’s room in my recent post, How to Make Decor Work for You: Balancing Beauty & Function. 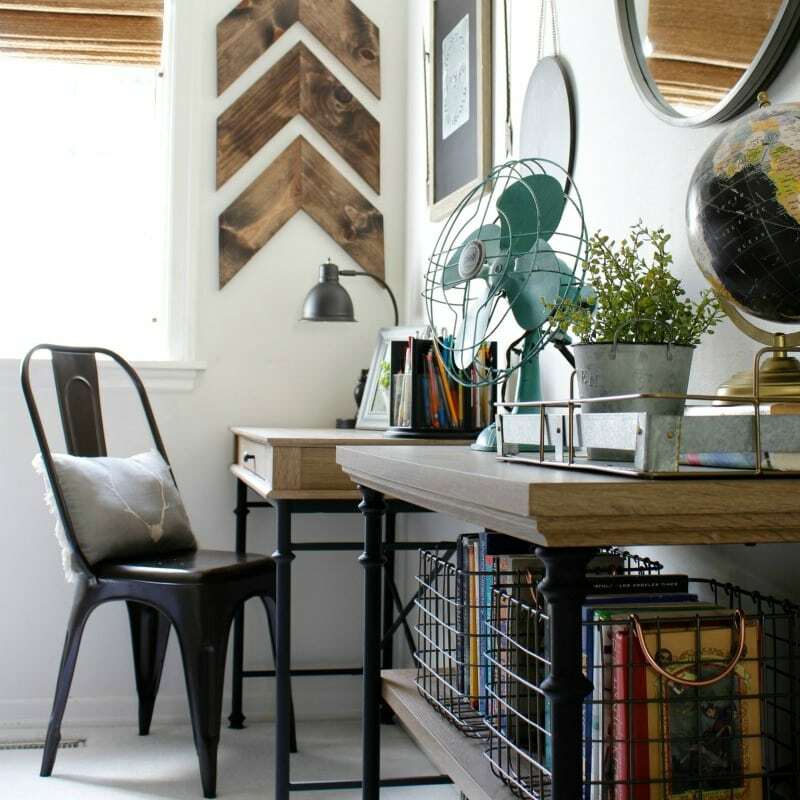 To enjoy more creative decorating ideas from our talented group of BHG Live Better Influencer Network bloggers click HERE. 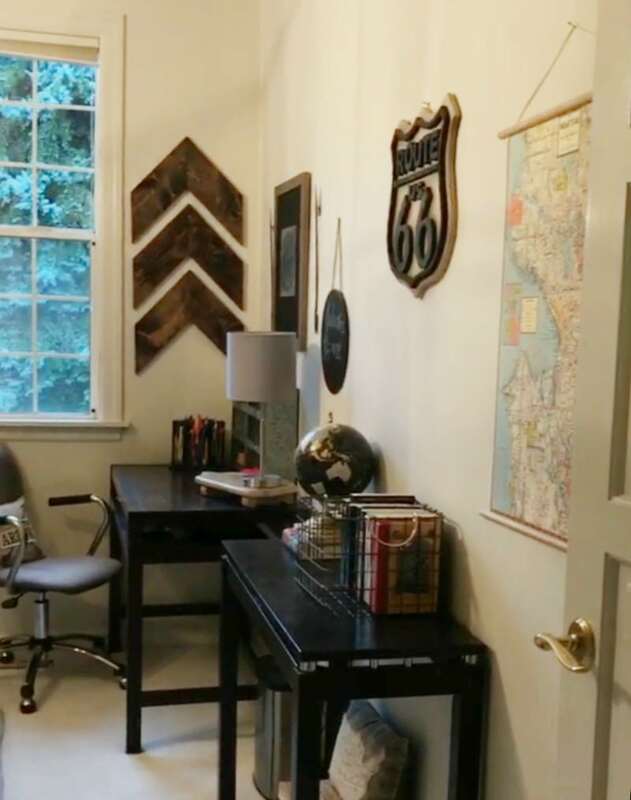 Now it’s time to show you how I transformed what used to be a basic 12-year-old boy’s room into a versatile room to welcome both our young adult son Frederick home, as well as our many guests. 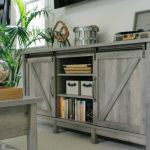 As usual I kept budget clearly in mind, so I turned to my favorite farmhouse furniture provider: Better Homes & Gardens at Walmart. I really love their selection of farmhouse furniture. When I want pieces that perform, provide beauty and funtion and stay on budget they really deliver. I’m so excited to show you the results. Can you even believe I got all these pieces plus tax and shipping for $530?? It’s almost unbelievable. (Still wrapping my mind around it haha!) 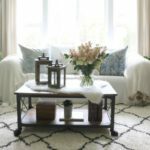 The prices of the Better Homes & Gardens collection at Walmart are a game changer. Shopping elsewhere I might have been able to purchase one piece of furniture. Basically I feel like their options make redecorating possible in a whole new way! The topic of matching and mixing is always an interesting one. As decorators we are constantly pondering this balance: to match or mix. How much matching is good? What is the right amount of mixing? It really all depends on you and what you prefer. Matching is easy…both easier to do and easy on the eye. So as a decorator it feels a little bit like a cop out. It’s a bit old school as well. It is more modern to be freer and not conform to matching. 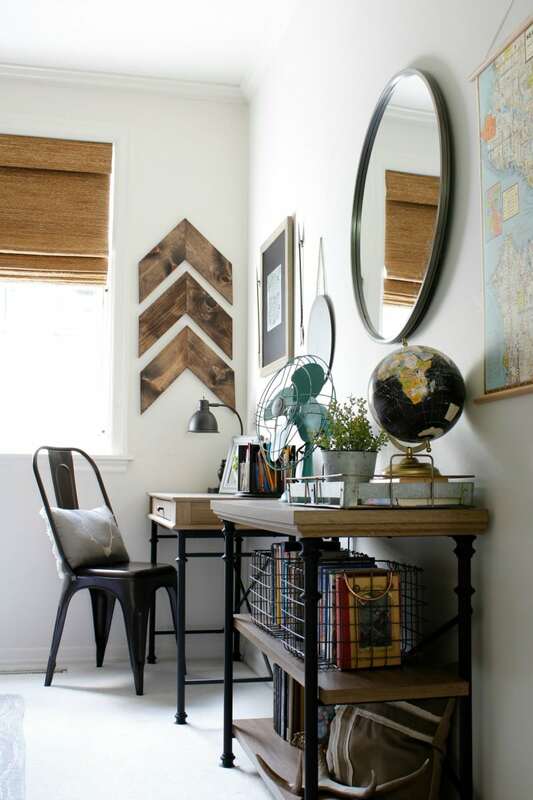 Rooms that feel too “matchy-matchy” are passe. With that being said, we want our rooms to feel harmonious. 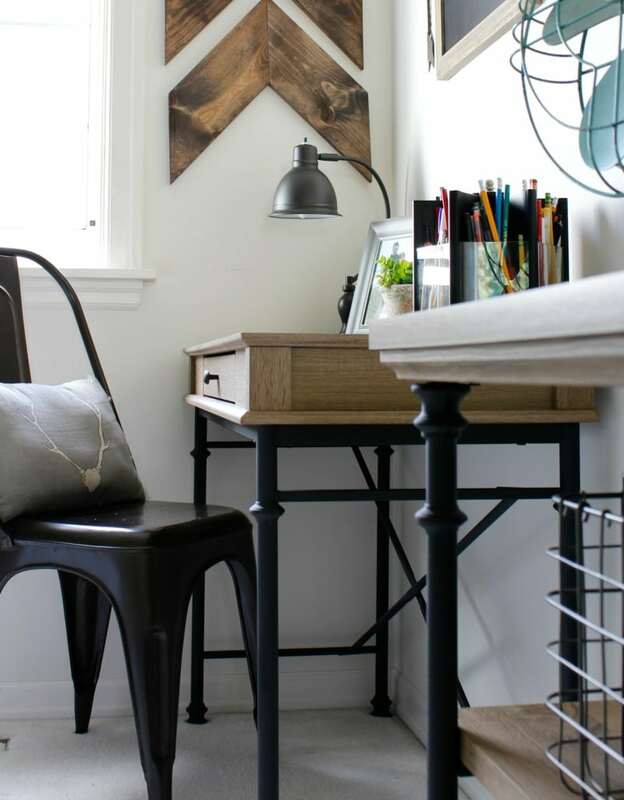 In this space there were several factors that made me want to create a more harmonious feel. 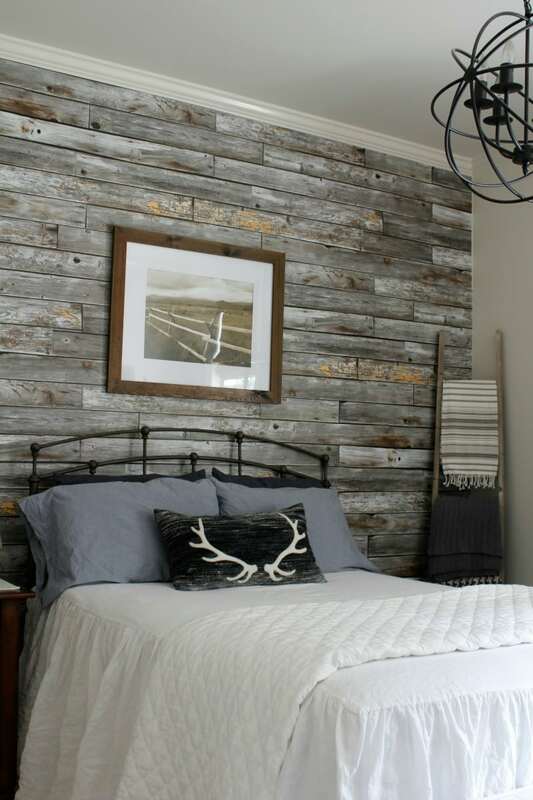 To begin, the rustic wood wall creates a bold statement. This mood already made me feel like I could get away with more of a matched look with the furniture. Also, the decor elements held enough of an eclectic mix that I knew the space needed to be brought together. Jodie and I discussed the purchases beforehand. She asked me if I was concerned about buying 3 pieces from the same collection. I told her that I thought it was going to work in the space. Now that it’s completed I really like it, and I’m so happy I trusted my instincts. It wouldn’t always be the right decision, but we take each space into consideration. In the end, the balance is a gut feeling and a personal choice. As I mentioned above the prices of the Better Homes & Gardens products at Walmart are amazing. Let’s talk about this: How are they able to provide such affordability? I have personally built 5 of their pieces, 2 for Julian’s room and 3 for this room. I built all 5 with no help and no prior experience. They engineer it and you put it together. Of course there is a time commitment. Depending on the piece it can be 1/2 hour to 2-3 hours. But in my opinion it is totally worth it. Don’t worry…if I can do it, you can do it! Well protected in shipping. All 5 of my pieces have come in perfect condition because of the quality of packing and reinforced boxes. Best instructions I’ve ever read. Worth your time to have a quality piece at an amazing price. Feeling of satisfaction and empowerment! Better Homes & Gardens at Walmart is all about value for your money. And when budget is high on the list of priorities it’s such a blessing to have Walmart on your side. Before this most recent restyle I had already changed out the bed. Previously it was a traditional style twin bed which would not work for my older, full-grown son. Nor would it be nice for guests. Below is a photo of the room from last year before I started the transformation. 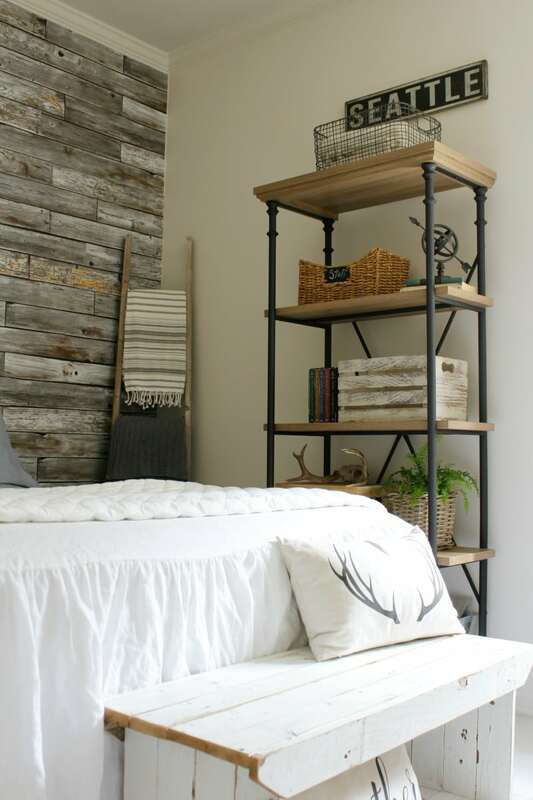 The new bed I chose is a full-size rustic wrought-iron bed perfect for the farmhouse bedroom look I wanted. The bedding I changed to a beautiful all-linen white coverlet. 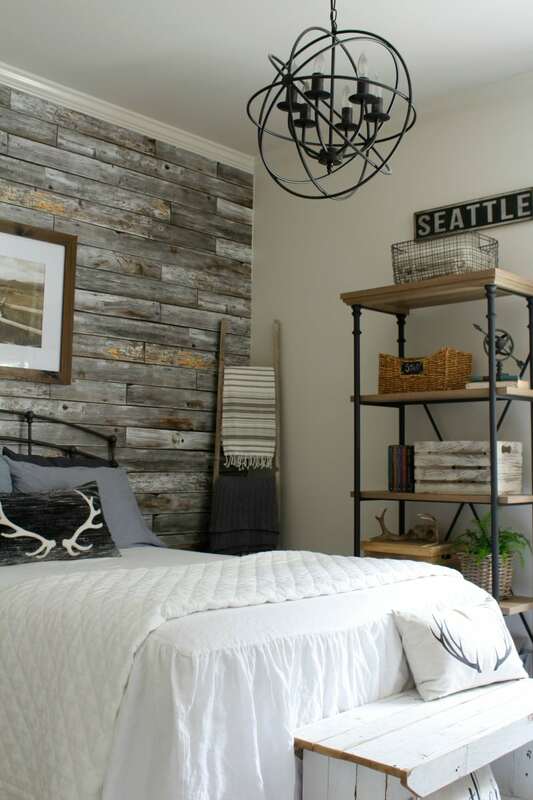 Pillows in dark heathered gray and blue jean add a rustic feel. The handmade antler pillow completes the look. The other change I made was swapping out the old white blind for a new woven wood blind. It adds such warmth to the room and compliments the farmhouse style. 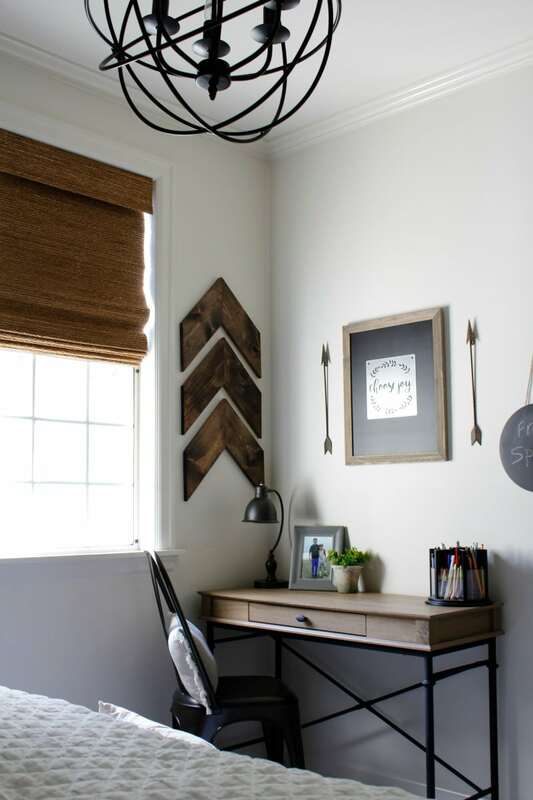 I love the no-fuss look of a simple wood blind in this room. 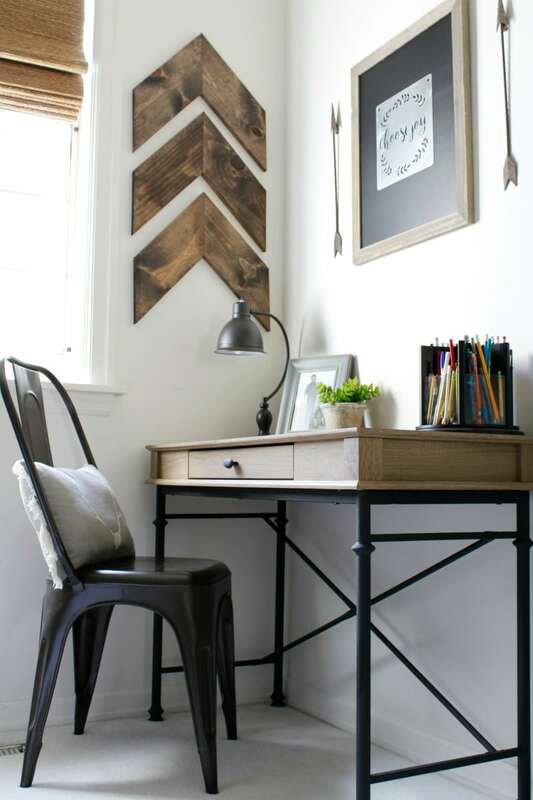 For more creative ways to refresh a space, visit the Better Homes and Gardens Website! 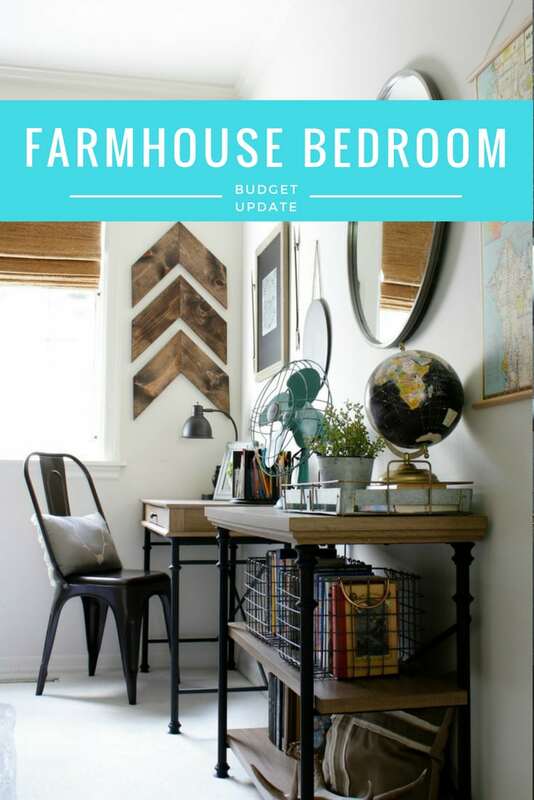 Looking to create a budget-friendly farmhouse bedroom? 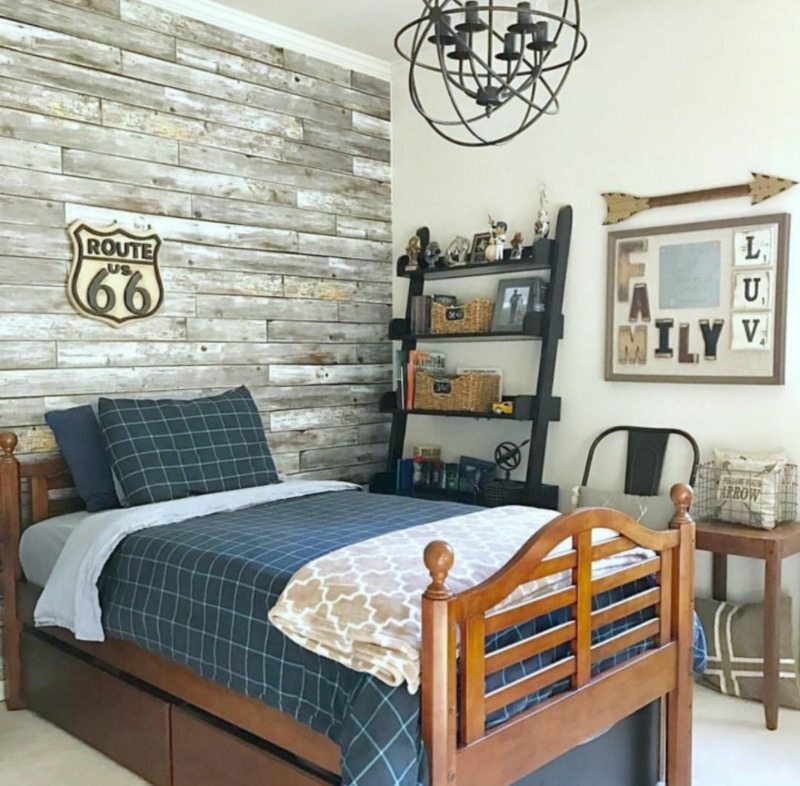 Here is how I transformed my son's no-style bedroom into a quaint, versatile farmhouse bedroom without breaking my budget. Looks fantastic! I love the bedding…will you share those sources as well? 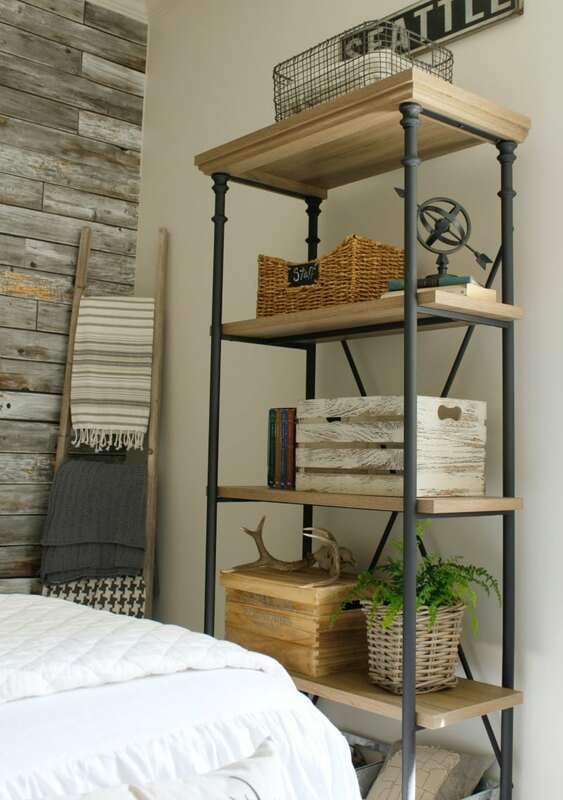 I know u framed this as a farmhouse look, but I think young Millenials and others starting out would really embrace the look and how inexpensive to get the look, rather than Ikea decor. I love the makeover!! Great job!! And I can’t wait to visit Walmart! Beautiful makeover! Question… what paint color did you have on the walls? This room really drew me in with excitement. 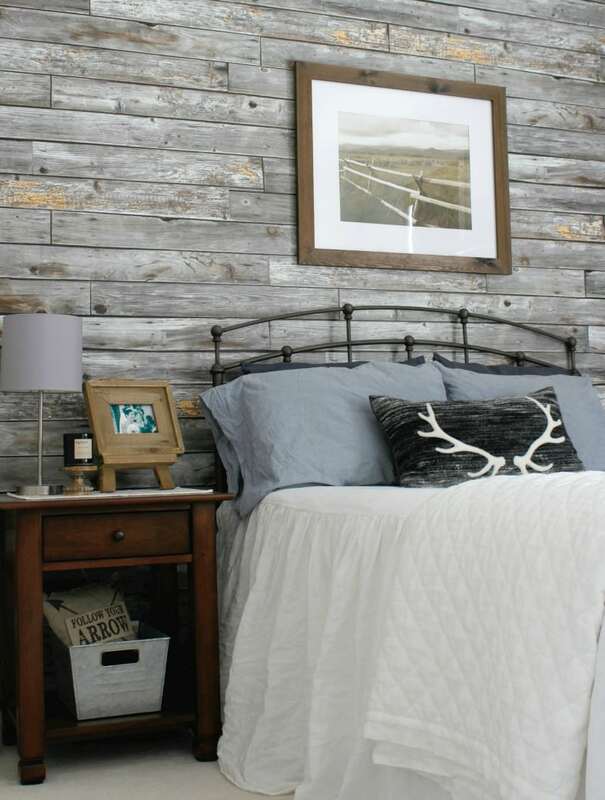 I always wanted to do a farmhouse bedroom. 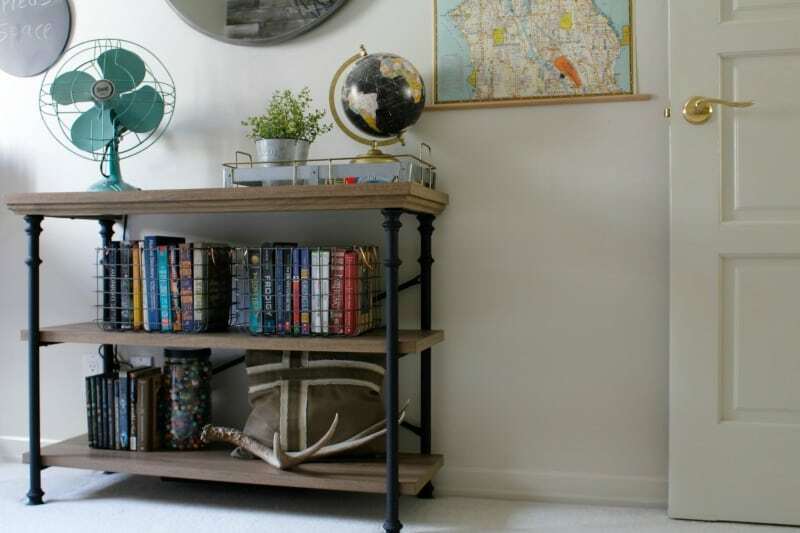 Love the pieces from Better Homes and Garden at WalMart. The wall, the bedding, the decor, is all so pleasing to the eye. Very nice pieces and well priced! I absolutely love it! Where did you get the fan? I have been looking for one! I really like the style of the furniture. It is a very comfortable room and I am sure your guests will enjoy it. 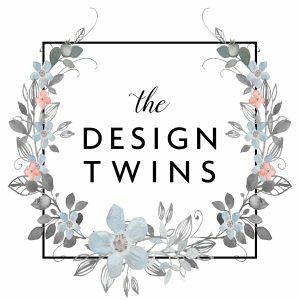 Dawn says, thank you for your blog post.Really thank you! Awesome. This room looks great! I am wondering if you remember where the light fitting came from?